Once upon a time, little me wanted to be a magician. In the 90s, as most fangirls my age pined over NSYNC, I instead pined over the likes of David Copperfield and any wacko who knew card tricks. Magic at the time seemed like the most wonderful thing in the world, and I devoted hours to practicing tricks of my own, because apparently I had no concept of cool even back then. And while those dreams have thankfully crumbled like your opinion of me after reading that confession, my love for the magical has continued to grow, mainly through travel. Luckily, as my recent jaunt over to the Czech region of South Bohemia revealed, magic isn’t solely reserved for weirdos in capes. And after a long weekend rolling through South Bohemia myself, soaking in every last carbohydrate, I’d like to present you with the most magical places need to see the glorious South Bohemian region. If you don’t believe in magic yet, you’re about to. *throws glitter* Enjoy! Of course, I need to start with the big guns. If you’ve heard of any place in South Bohemia before, this would probably be the one. 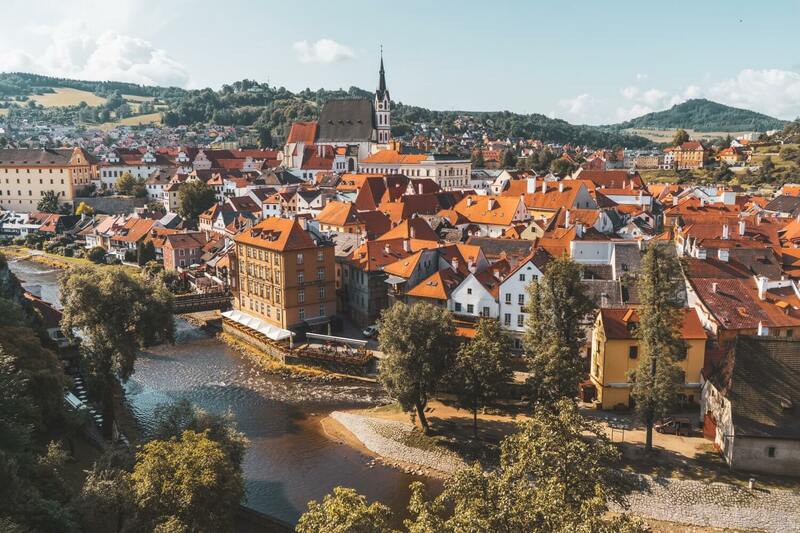 While definitely a secret no longer, the popularity of Český Krumlov is one that it thoroughly earns through a spellbinding charm present in every corner . Built into a winding bend along the Vltava River, this gorgeous little town is frequently hailed as one of the most beautiful in Europe… which makes a lot of sense to me. There’s amazing viewpoints in abundance, with its hilly terrain guaranteeing stellar views of their characteristic orange rooftops framed by cascading green hills. Its crown jewel is of course Český Krumlov Castle, second only in size to the one in Prague. 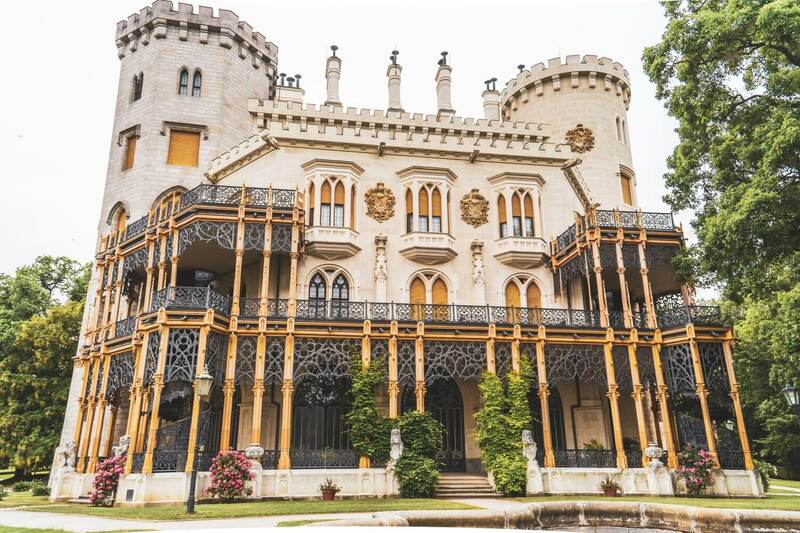 With a beautifully painted (pink) Renaissance tower and hectares of spellbinding gardens, it’s no wonder tourists come here in droves, eager to catch a piece of the fairytale for themselves. Next up, I bring you a place fit for a royal wedding. After all, Hluboká Castle (located a short drive from České Budejovice) takes its inspiration from Windsor Castle in England, the grand stage for this year’s royal nuptials. Hluboká Castle was originally founded in the 13th century by Bohemian Kings, but after a series of re-dos and renovations, its current gorgeous look can be owed to the famous Schwarzenberg family, who also introduced the perfectly manicured park to the property. With 140 rooms, 11 towers and a whole lot more photo opps, this castle is a must-see when in South Bohemia. I didn’t have time to do a tour of the inside, but wandering the grounds was more than enough for my fairytale heart. The spiral staircases and details in the back garden are especially swoon-worthy. PS: Movie buffs might even recognize the castle from the early 2000s martial arts comedy Shanghai Knights. Don’t be ashamed to admit you’ve seen it – it’s okay, this is a safe space. From its glittery origins as a royal town to its now youthful rep as a university city, České Budejovice (the capital of South Bohemia) is one that will have you reeling from its beautifully colourful architecture and equally beautiful beer. Since the city is best known for its “Czech Budweiser” Budvar beer (not to be confused with its American counterpart), the best way to soak in the ambiance of the town is with a nice cold Budweiser in hand… Or perhaps by touring the place where it’s brewed. 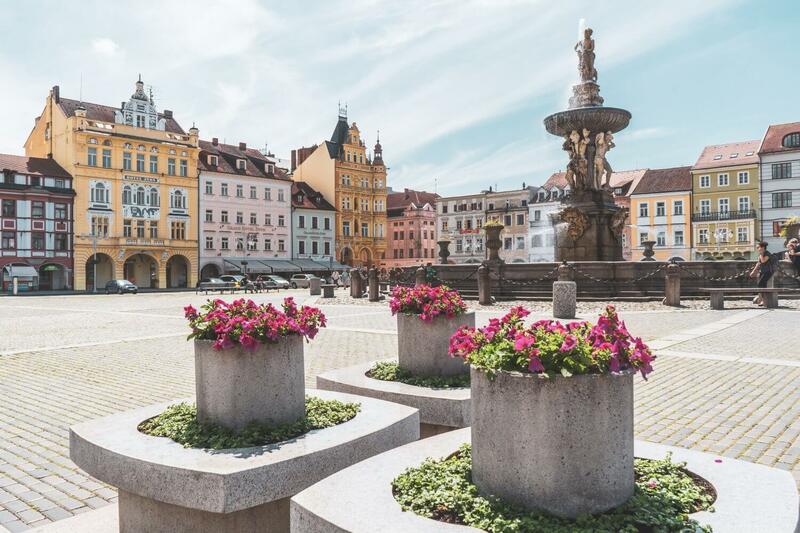 While České Budejovice is less about “seeing sights” and more about absorbing its historical yet youthful ambiance, make sure you don’t miss its gorgeous town square, which is one of the largest in Europe. Its centerpiece is a beautiful Baroque fountain that looks even more magical by night. Scattered all around South Bohemia are colourful towns – enough to warrant a photo stop every 5 minutes. My favourite of such towns however had to be Jindřichův Hradec, where we stayed our second night. 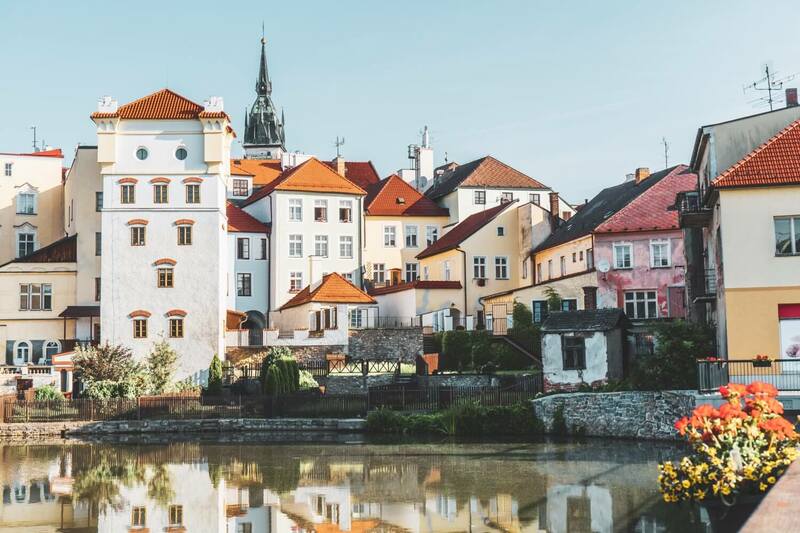 If you’re able to shake off the grogginess from all that Czech beer, try to wake up early and catch the town at its sleepiest and most endearing, as stillness envelops the city and fishermen perch next to ponds hoping for their first catches of the day. The perfectly still reflections of the town over Vajgar Pond (especially of the local chateau) is enough to make you want to stay forever. Of course, Jindřichův Hradec is also known as the perfect gateway to Bohemian Canada, an area so named for its lush nature and endless green. Naturally, this Canadian felt right at home. All I needed was a barrel of maple syrup and a crate of poutine, but hey, you can’t win them all. 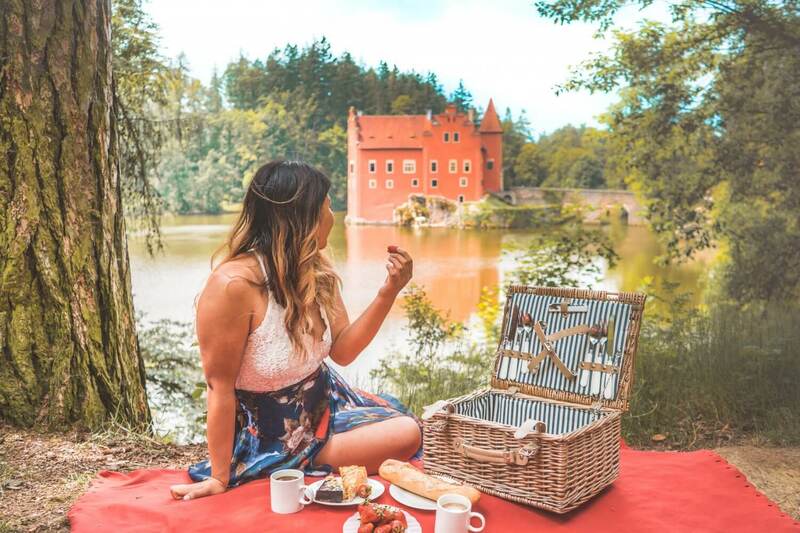 This magical little red-pink castle, found in the center of a lake is probably one of the most fairytale-esque places you’ll encounter in the South Bohemian region (and that’s saying a lot). It’s no wonder I saw probably three different wedding couples during my short time here. This gorgeous little summer home, built in the 16th century lends itself to the perfect relaxing morning/afternoon, with little walking trails around the lake and even boat rentals too, so you can enjoy your own “Notebook” moment 😉 Ryan Gosling sold separately. MY TIP: Rent a picnic basket from the nearby Červená Lhota Restaurant and enjoy a ridiculously scenic picnic. The food is delicious and you honestly can’t beat the views. Last but not least, from fairytale to sci-fi, I couldn’t omit Lipno, possibly one of my favourite stops on this trip. Located close to the German border, Lipno nad Vltavou is a town that I like to consider a little gateway to adventure. While popular for skiing in the wintertime, in summer it transforms into a green oasis of micro-adventures. We hopped on a ski lift (my first time on one, can you believe that?) that slowly whisked us up to the top of a mountain, passing lush green forests along the way, and smugly glancing at the folks below us who were hiking up. The most distinctive attraction here is the Lipno Treetop Walkway, an ultra-modern sci-fi looking structure that brings you on a gradual incline, skimming along the tops of trees, with sweeping views of the Šumava countryside the alluring Alps in the distance. After this, we got to ride the fast tube slide down and take push bikes down the mountain (so much fun, even when a spontaneous storm kicked in, and I fell off like the clumsy giraffe that I am). MY TIP: Get a Lipno Card for great savings on all the different activities. It’d be such a shame to come here and not walk on the treetop walkway, go down the slide, or try one of the many push bikes (AKA scooter bikes) that you say lying around. Alright, so now that you’re sold on all the amazing places you can visit, here’s some practical information about actually getting there. If you plan on RENTING a car though, do be wary of the fact that many car rental companies will charge extra for bringing cars into a new country (here’s an in-depth list of hidden fees to watch out for), and some might not allow rentals to cross into the Czech Republic. If you plan on renting a car, I recommend you take a bus or plane into the region first and then renting a car when you’re in the country (as we did). This is a hard no, at least based on my research. A lot of the train routes would have to go through Prague and there’s usually quite a few stopovers until you get to South Bohemia. I remember that the train options from Munich were something insane like 11 hours, whereas a bus was half that. I always use GoEuro to compare/book transportation options within Europe. It’s totally free and lets you compare buses, trains, planes, etc. side by side. Really handy if you want to see what the cheapest, quickest and best options are! Flixbus: Alright, very cheap, lots of connections from around Europe, but service is meh and unlikely to be punctual. You can read my full honest review here (as I’ve used them dozens of times). RegioJet: I love these guys. I used them two years ago and it was the nicest bus experience I ever had. They operate mostly in/around the Czech Republic but offer very cheap fares so you can use them to get around the country easily, though international transfers might be less common. There are no international airports in South Bohemia itself, so you would need to fly into one of the closest international airports (Prague, Vienna, Munich or Linz) and then rent a car or rely on public transportation. If you’re looking for a place that’s busier, České Budějovice or Český Krumlov would be a great choice. Český Krumlov offers a much busier (but touristic) atmosphere. There are tons of restaurants open and bars later in the night too if that’s what you’re after. The extra bonus of staying here is that you can experience the magic of Český Krumlov by night (which is amazing after many of the day trippers have gone home) AND you have the bonus option of waking up extra early to catch all the attractions before the crowds arrive. In peak season, this will be the only way to feel like you have the city to yourself. České Budějovice will also have restaurants and bars open, but with a much more local vibe than Český Krumlov. There will be plenty of bars (and open-air drinking) thanks to the city’s student population, which means there’s a lively atmosphere but without the company of mostly other visitors. Lastly, if you’re looking for something quieter and quainter, I highly recommend staying in Jindřichův Hradec. The town is so beautiful in the morning and you’ll easily feel like one of the only tourists there. Hey, if you enjoyed this post full of fairytale travel inspo, why not save it for your bucket list later? 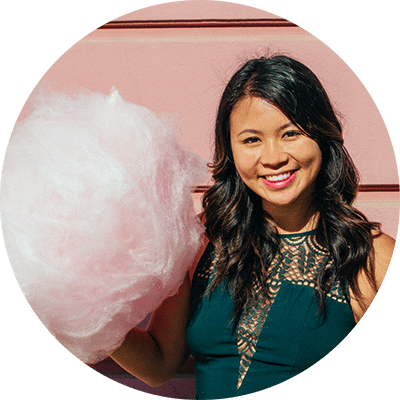 Feel free to hover over the left hand corner of that graphic to save it on Pinterest! I thoroughly enjoyed this! What a beautiful place!! That first castle (I’m not going to try and spell it haha) is so lovely!! And the towns all look like they’re straight out of a fairytale. South Bohemia is moving higher up on my travel list! Just wow! I was looking forward to this post after your recent Instagram stories – it is so ridiculously beautiful there that I’m now seriously considering it for my next summer trip. Hmm, here or Iceland? Tough choice! But either way, South Bohemia is firmly on the bucket list now so thanks a million! Woah THAT CASTLE!! How has Disney not based a castle after that one? It’s so stunning! Oh my now I have to add this to my itinery in September!! Thanks for sharing I Love cities so rich in history. Each of these spots is so picturesque! Love the backdrops, the colourful houses, the magnificent architecture, and of course, the beautiful scenery. There is something so fairytale-esque about these places. You won me over! This definitely puts Bohemia on the map for me. Such beautiful views, just wow! The boyfriend and I have been considering visiting Czechia (we really want to visit! ), and that’s just strengthened by desire by about, oh I don’t know, roughly a thousand! I was going to visit Prague, but I’m really strongly considering South Bohemia now. And thanks also for providing such detailed information about how to get there! I’m completely in love with Munich, so travelling to there and onwards via bus is very tempting. Also, as a Brit, that castle is much prettier than Windsor! 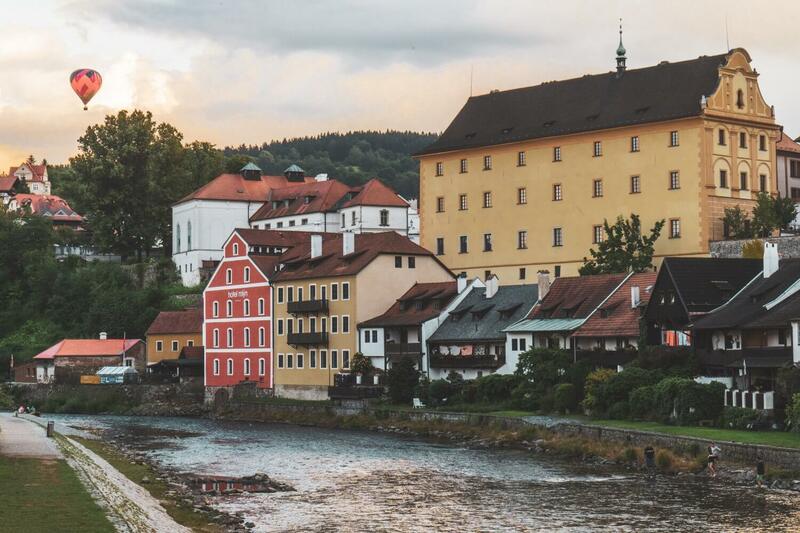 Outside of Czechy Krumlov I hadn’t heard of any of these places, but now I’m dying to go! 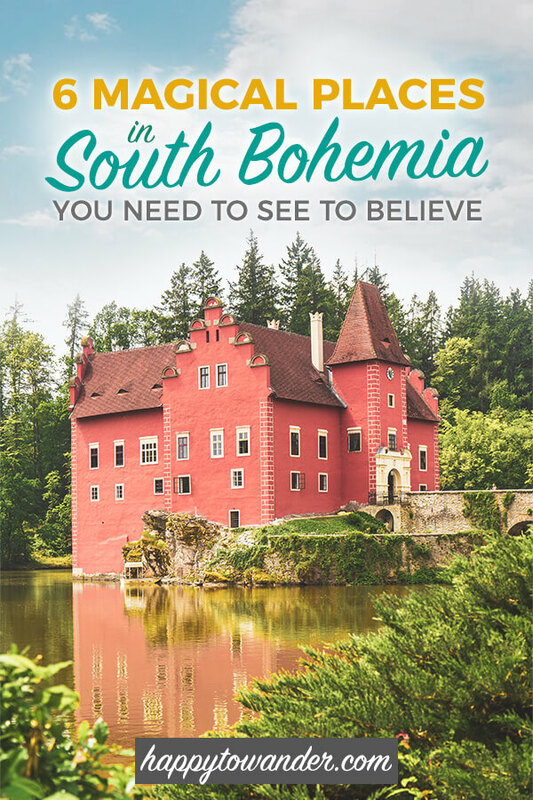 Loved reading about South Bohemia. I have just returned from a trip to Prague where I spent 3 magical days. I didn’t have time to do any of the small towns on this trip but your write up has motivated me so much that I will definitely plan another, exclusive trip to the Czech Republic, devoting all the time that this country deserves. What girl wouldn’t be persuaded by colorful little towns and magical castles? I’m sold!